New research from James Cook University has provided fascinating insights into the lives of baby turtles on the Great Barrier Reef. The researchers have discovered one of the reasons no flatback turtle from Eastern Australia has been found outside the confines of Australia’s continental shelf for at least 50 years. New research from James Cook University has provided fascinating insights into the lives of baby turtles on the Great Barrier Reef. The researchers have discovered one of the reasons no flatback turtle from Eastern Australia has been found outside the confines of Australia’s continental shelf for at least 50 years. Using computer modelling of ocean currents, JCU’s Natalie Wildermann and co-researchers found that it was impossible for baby flatbacks to remain inside the reef’s boundaries by simply drifting with the current. She said the data from the SLIM oceanographic model instead proves that hatchlings must actively swim to sites within the GBR. “It had been thought that marine turtle hatchlings drift passively in ocean currents, and that these currents would take them to favourable habitats for their development. But recent studies, including ours, show that the hatchlings actually disperse actively. So they swim, and they swim in a certain direction to reach or avoid some currents,” Ms Wildermann said. She said the baby turtles are adapted to the turbid coastal waters of the Great Barrier Reef and thrive in its conditions. Ms Wildermann is working in conjunction with JCU’s Associate Professor Mark Hamann and Adjunct Professor Eric Wolanski and Dr Mariana Fuentes (former JCU, now Florida State University). 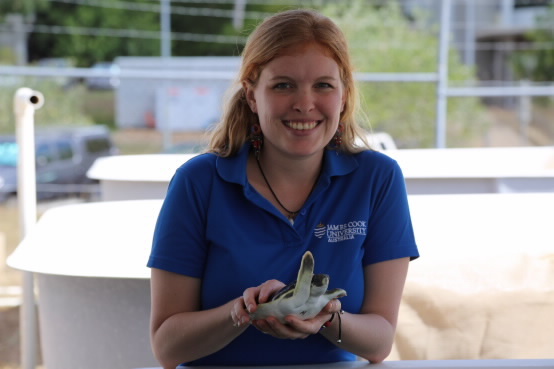 Ms Wildermann recently won the Archie Carr Student Award for the best Biology Oral Presentation at the 35th Annual Symposium on Sea Turtles. She said the mystery still remains as to how the hatchlings know where to swim. “The actual cues that turtles use to know when, where and in which direction to start swimming are still unknown, but it is a big first step to find out that they are active swimmers during the hatchling life stage,” she said. It’s thought that the turtles might feel magnetic noise, as do other species, or navigate by basic chemical cues. Thirty adult flatbacks, tracked by satellite during the past years, have all stayed within the boundaries of the Great Barrier Reef. Ms Wildermann said the impending release of JCU’s GPS-equipped baby turtles this week may provide some further clues as to how they navigate.